AML Energy is not 5 grams of BCAA and some caffeine. AML Energy is what an amino energy product should be -- a delicious, thirst-quenching drink that increases energy, heightens focus, boosts motivation, and aids mental and physical performance and burns fat. Using proven ingredients, at their clinically proven dosages, AML Energy will redefine your expectations of what an amino energy product should be. The fundamental reason you’re even interested in amino energy products in the first place, is that you need some energy. If you are in the market for an amino energy supplement, that also probably means, you’re not a big coffee or tea drinker, or that you don’t want to drink anymore of those beverages than you already do. And while you may not be particularly fond of the beverages, what you are fond of is the caffeine contained in them that gives you energy. Supplying the “energy” foundation of AML Energy is 100mg of pure energy in caffeine anhydrous. A powerful central nervous stimulant and dopamine agonist, caffeine increases energy, mental acuity, physical performance, and alertness. It’s also been shown to improve mood, performance, vigilance, and reaction, even when using doses as low as 32mg. Some might question why there’s only 100mg of caffeine included in AML Energy, when other amino energy products and pre-workouts contain two or three times as much. Because more doesn’t necessarily mean better, especially when it comes to stimulants. That’s why AML Energy doesn’t rely solely on caffeine for its energy. It also includes TeaCrine, a non-stimulatory, neuro activating compound that also promotes long-lasting wakefulness and alertness due to its actions as an adenosine receptor antagonist and dopamine enhancer. As an added bonus, TeaCrine is synergistic with caffeine, promoting more sustained energy than caffeine alone. Plus, TeaCrine does not come with the rapid tolerance buildup of caffeine, and may even help slow the onset of tolerance of caffeine. Together, the two make for an energy experience that is both smooth and long-lasting, but these two compounds don’t just boost energy, they also activate dopamine, which pays huge dividends for your ability to do work and improve performance. To further tighten and refine the focus and energy imparted by AML Energy is L-Theanine. L-Theanine is an amino acid found prevalently in green tea leaves. It’s noted for its ability to induce a sense of calm and relaxation. When Theanine is paired with caffeine, as it is here, some pretty cool things happen. Most notably, theanine helps to “dial-in” your focus. We all know that caffeine stimulates us, which can make us focus, but not necessarily on what we need to do. That’s where L-Theanine comes into the picture. As you’ve experienced yourself, a wandering mind is an incredibly common occurrence, especially with all of the texts, alerts, reminders and various other interruptions we encounter on an hourly basis. Adding L-Theanine to caffeine helps create a tighter, more refined, and productive focus that helps you stay on task and achieve more during the day. As an added bonus, L-Theanine also helps “smooth” out the energy rush from caffeine, giving you a controlled sense of energy rather than the “run through a brick wall” kind that caffeine usually gives. Until now, we’ve discussed the ingredients that trigger the release of dopamine, and with it increased creativity, productivity, and focus, but a well-rounded energy supplement shouldn’t just include ingredients that stimulate dopamine production, but also ingredients that support the dopamine-generating process. AML Energy contains a powerful trifecta of dopamine-support ingredients in Tyrosine, Velvet Bean, and Folic Acid. L-Tyrosine is an amino acid the body uses to produce a host of important neurotransmitters and hormones, including dopamine, epinephrine, norepinephrine. Research has shown that 2 grams of L-tyrosine (the exact dose used in AML Energy) improves creative thinking. Additional studies have found that the same dose of the amino acid also improves individuals’ capacity to perform convergent thinking. FYI, this suggests that supplementing with 2 grams of L-tyrosine likely improve creative thinking, as convergent thinking indicates a greater capacity for creative thinking. Research also has shown that 2,000 milligrams of L-tyrosine vastly improves memory. And, as if those weren’t enough reasons to supplement with this powerful amino acid, consider this, L-Tyrosine may also increase your endurance capacity when training in the heat. Another important substrate for dopamine synthesis is L-Dopa, the direct precursor to dopamine. L-Dopa is found abundantly in Velvet Bean, a.k.a. Mucuna pruriens. Research indicates that supplementing with L-Dopa helps increase low dopamine levels. [15,16] Together, L-Dopa and Tyrosine serve as the “fuel” for dopamine production, which was ignited by the combination of caffeine and TeaCrine. Continuing with the engine analogy, the “grease” that keeps everything running smoothly is folic acid, which could be considered one of the most underrated dopamine-boosting supplements around. Folic acid is a highly bioavailable form of vitamin B9 that is required for the production of BH4, an important cofactor needed for dopamine synthesis. Research indicates that low folic acid levels are associated with reduced dopamine levels, which are linked to depression. By providing 800mcg folic acid, AML Energy helps ensure you body has ample amounts of the rate-limiting enzyme that regulates dopamine production (i.e. BH4) as well as the primary substrate (i.e. tyrosine) along with L-Dopa for optimal dopamine production, helping you think more clearly, be more focused, and get more done. Taking everything together, it’s clear to see that AML Energy isn’t your ordinary amino energy supplement. Quite frequently, consumers use amino energy supplements as a lower stim pre-workout, yet when looking at the supplement facts for many of these supplements, very rarely do they contain any performance-enhancing ingredients, and if they do, they’re not dosed anywhere near the research-backed dose. AML Energy includes both Citrulline and polyphenols from grape skin extract to boost nitric oxide production, blood flow, and performance. 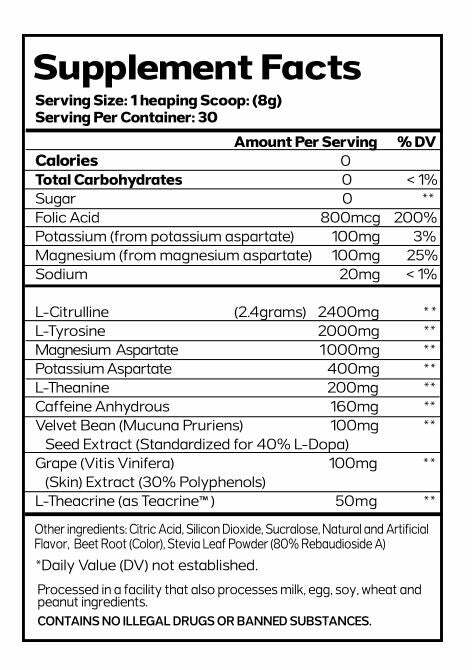 L-Citrulline in a nonessential amino acid well known for its superior bioavailability to L-Arginine, another common NO-boosting compound. However, citrulline has been shown to be better absorbed by the body and superior for increasing plasma arginine than the free from L-arginine. In other words, if you want greater nitric oxide production, you want to use citrulline, and not arginine. Recent studies have shown that supplementing with 2.4 grams L-Citrulline reduced the time needed to complete a 4 km cycling trial as well as feelings of muscular fatigue and soreness. AML Energy includes the full 2.4 gram dose used in the clinical trial to support optimal blood flow and performance during training. 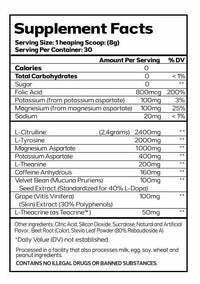 Also included for added nitric oxide support is grape skin extract (standardized for 30% polyphenols.) Grape skins are rich in polyphenols, micronutrients highly regarded for the health-promoting properties. Recently, sports scientists have begun exploring the potential for polyphenols to improve exercise performance, due to their effects on vascular function, nitric oxide availability, and the release of endothelial-derived constricting and relaxing factors. In fact, a 2017 study notes that supplementing with a polyphenol-rich extract significantly increased total power output (5%), maximal peak power output (3.7%), and average power developed (5%). Researchers noted that these increases in performance also came without increasing heart rate than typically would be required or inducing more fatigue, suggesting that polyphenol supplementation improves endothelial function. Supporting your nitric oxide production, just as it did dopamine production, is folic acid. This powerful B-vitamin improves endothelial function, and therefore nitric oxide availability, by increasing BH4 and decreasing homocysteine levels. Thus far, we’ve discussed how versatile AML Energy can be. It’s an energy booster, productivity enhancer, performance booster, and mood elevator. You can also add thermogenic and fat burner to that list too. 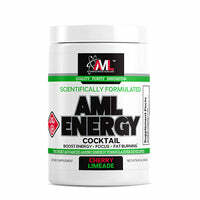 AML Energy contains multiple ingredients shown to improve thermogenesis, energy expenditure, and fat loss. Up first, and this comes as no surprise, is caffeine. While it’s known for its energy, focus, and performance-enhancing qualities, caffeine also serves as an effective appetite suppressant and weight loss aid. Caffeine increases thermogenesis (i.e. calorie burning). Research conducted in both lean and obese individuals notes that consuming 100mg of caffeine (the same dose in AML Energy) enhances energy expenditure up to 150 calories per day! Even though 150 calories might not seem like a tremendous amount, every little bit helps for those trying to enhance fat loss and prevent weight gain. Next, is the nitric oxide-boosting favorite -- citrulline. A French study from Paris Descartes University using overweight rats fed high-fat diets documented that citrulline supplementation reduced blood sugar production in the liver, and stimulated abdominal fat loss. Furthermore, citrulline also enhances brown fat activity, thereby increasing caloric expenditure and fat burning. In case you weren’t aware, brown fat is highly thermogenic burning energy as heat rather than storing it as fat. Citrulline also has been shown to raise levels of hormone-sensitive lipase by 150%, further supporting fat mobilization and use. And, while we’re on the subject of brown fat, we should also mention that dopamine increases thermogenesis in brown adipose tissue. Most of the research into catecholamines has focused on the role of epinephrine and norepinephrine and brown fat activity, but some research from 2017 indicates that dopamine also has a hand in helping you burn body fat. Seeing as AML Energy is a powerful dopamine boosting supplement, it’s pretty evident to see that it can also help boost thermogenesis and fat burning. The final way in which AML Energy supports fat burning and weight loss is through the inclusion of polyphenols present in grape skin extract. As we discussed above, polyphenols have been the subject of intense research in recent years for the world of benefits they can offer. These benefits also include weight loss. Researchers also advised that more research needs to be carried out on polyphenols before they’re recommended as an adjunct means for weight loss, but these early results are promising to say the least. While AML Energy contains a great many ergogenics, three things it does not contain are leucine, isoleucine, and valine -- the three branched-chain amino acids (BCAAs). “Why doesn’t AML contain BCAA?” You might ask. Simply put, there’s really no benefit to supplementing with additional BCAA during the day if you’re meeting your protein requirements. Furthermore, there’s a good bit of scientific research indicating that supplementation with the BCAAs, especially leucine before exercise, decreases dopamine levels. [23,24] This is due to the fact that leucine competitively inhibits L-Tyrosine, the nutritional dopamine precursor. Leucine (found in AML Post Workout) is the most potent anabolic trigger and best taken post-exercise (with AML Post-Workout) before a post-workout meal. Again, we ask, why supplement with more of something that you don’t need in the first place, especially if it potentially worsens your performance? It doesn’t make sense, and that’s why AML Energy contains NO BCAA. Another common ingredient you’ll see in energy drinks and energy amino supplements is taurine, a non-essential amino acid that maintains cell volume, aids muscle contraction and supports antioxidant defense systems in skeletal muscle. Similar to BCAA, the inclusion of taurine might not be so beneficial for your energy levels, performance, or productivity. A host of human studies have noted that the combination of taurine + caffeine did not improve performance, energy, or attention. [25,26,27,28] However, the popular taurine + caffeine combination did reduce feelings of vigor and the stimulating effects of caffeine. Furthermore, one of the aforementioned studies, also noted that the combination of caffeine and taurine actually increased feelings of fatigue. So, if you want less stimulation, effectiveness, and productivity from your caffeine, along with more fatigue, feel free to combine taurine + caffeine. But, if you want to get the most from your caffeine, avoid mixing it with taurine. That’s why Taurine is nowhere to be found in AML Energy. AML Energy -- Energy Aminos That Work! Until now, amino energy drinks were basically nothing more than a handful of BCAAs along with some caffeine. And while there’s nothing “wrong” with that approach, Advanced Molecular Labs sought to make the amino energy category something more than just a modest energy booster. 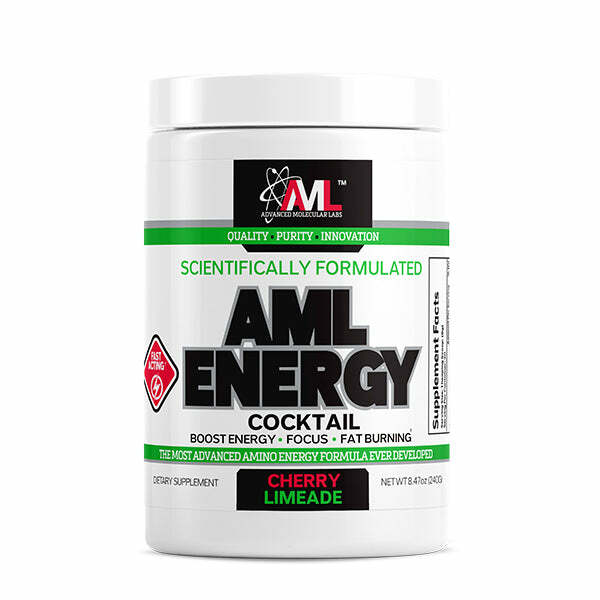 AML Energy is low in sodium and contains the important electrolytes potassium and magnesium from the amino acid mineral salts potassium aspartate and magnesium aspartate. Dietary potassium and magnesium have been shown to lower blood pressure (likely due to the capacity to increase vasodilation) and are important for energy metabolism. AML Energy is an energy amino product that boosts energy, but also improves focus, creativity, productivity, exercise performance, and fat burning. When taken all together, the choice is clear. If you want your amino energy product to work for you, choose AML Energy. AML Energy is an advanced scientific formula designed for anyone looking for a boost in energy and alertness which includes athletes, students, gamers and motivated professionals. AML Energy is the clear choice for a mental and physical edge in the office, class or even the gym. Dopamine is often called the “motivation molecule” for its ability to enhance concentration, drive, and focus. This vital neurotransmitter plays a vital role in both pleasure and reward, as well as mood, memory, movement, and decision-making. In other words, dopamine is really, REALLY important for having the inspiration to work, doing the actual work and feeling a sense of satisfaction and gratification after completing said work. Without it, you’d be a lifeless slug moping on your couch, eating bon bons and watching reruns of the Real Housewives of Orange County. Furthermore, dopamine also plays an important role in exercise performance as well. During intense exercise, dopamine is depleted, reducing motivation and performance while increasing fatigue. By increasing dopamine, you can maintain a high level of performance, stave off fatigue, and reach new heights of athleticism. While most supplements, including pre workouts, rely solely on caffeine to boost dopamine levels, AML Energy takes a more holistic approach, including ingredients that trigger dopamine release as well as the ingredients your body requires for optimal dopamine production. Chief among these is caffeine, quite possibly the strongest (legal) dopamine-boosting supplement there is. Caffeine stimulates your dopamine receptors, creating a flood of the motivation and focus-elevating compounds that help you get in the zone and get to work ASAP. Supporting the dopamine cascade instigated by caffeine is TeaCrine, a purine alkaloid that supplies long-lasting energy and focus as well as improved cognitive function. TeaCrine is a chemical cousin of caffeine, and while it enhances mental alertness, it does NOT impact the cardiovascular system in the manner that caffeine does. This means you won’t get the jitters, anxiety, or crash that accompanies high stimulant intake, but you will experience the increased mental energy, focus, and performance.